Riviera salmon at Fig & Olive Melrose Place. Celebrate the holiday over lavish brunch spreads, endless seafood displays and free flowing champagne. Who says you can’t celebrate the Easter holiday with some Korean BBQ in the heart and soul of Koreatown? Check out where to eat Easter brunch in Los Angeles. From decorated 100% Valrhona chocolate eggs (with treats inside) to a Beverly Hills-themed Easter egg hunt and decadent brunch—the Beverly Wilshire is the perfect place to celebrate the holiday. Pastry Chef Chris Ford’s distinctively designed, 100% Valhrona, chocolate Easter eggs come in Sunny Side, Faberge Basket and Carrot Top-themes; eggs include a selection of wrapped caramels and chocolate truffles hidden inside ($45 each). The Easter-themed hybrid scavenger hunt and sightseeing tour on March 26 is a fun way to celebrate the holiday, enjoy some delicious pastries and explore Beverly Hills. The Blvd offers a lavish Easter brunch that includes house-cured gravlax, duck confit hash, braised spring lamb shanks, seafood pasta and dessert buffet ($65/pp, $25/pp for the bottomless bubble bar). Celebrate Easter with a decadent brunch complete with giant chocolate Easter eggs, visit from the Easter Bunny and Easter egg hunt. The buffet includes a variety of stations from Executive Chef Cyrille Pannier. Fill your plate with favorites including an Alaskan king crab station, Belgian waffles, omelets made to order, dim sum, sushi and an elaborate carving station with honey glazed smoked ham and roasted prime rib. Other savory entrees include crab and lobster cakes, cheese blintzes, Cornish game hen rotisserie and miso-glazed salmon. Also enjoy a farmers market salad station and a chocolate candy dessert station with housemade giant chocolate Easter eggs, gelato and piping hot doughnuts. Brunch 10 a.m.-2 p.m. at Culina, Modern Italian; Easter egg hunts will take place at 11 a.m., 1 p.m., and 3 p.m. Easter Bunny will be at the brunch and you can visit with the balloon and tattoo artists from 11 a.m.-3 p.m.
From a bountiful Easter brunch in the Huntington Ballroom, Chef’s Market Brunch in The Royce Wood-Fired Steakhouse to Easter Dim Sum Brunch in The Terrace, you have an array of celebrations options at The Langham. Bring the kids for an Easter egg hunt in the Horseshoe Garden that also features a train and petting zoo. Celebrate at the Montage Beverly Hills over a decadent Easter brunch at Scarpetta. Executive Chef Freddy Vargas offers a buffet brunch with dishes like fresh seafood, breakfast fare like polenta waffles and lemon-blueberry ricotta pancakes; ricotta agnolotti with brown butter and parmigiano, leg of lamb with raisin relish and more including complementary children’s activities and an Easter egg hunt. 11 a.m.-2 p.m. $110/pp, $22/pp bottomless mimosas, bellinis and bloody marys; $35/pp children 5-12. Dine with perfect views of the sea at the Terranea. Their Champagne Ballroom Brunch offers champagne, a selection of housemade morning pastries, an egg and omelet station, an Asian kitchen buffet, pasta and risotto station, carving board, cheese and charcuterie, salad bar, dessert station and more. The event will also feature a children’s buffet and children’s dessert table. Seatings from 9:30-a.m.-2 p.m. Tickets must be purchased in advance. $95/pp, $47/pp children 4-10, free for children 3 and under. Chef Marcel Vigneron’s (Top Chef, Marcel’s Quantum Kitchen) new restaurant launches their weekend brunch just in time for Easter. The menu offers Chef Marcel’s take on classics like eggs Benedict with hollandaise foam; chai French toast; herb omelet with crispy chicken skin; chicken and waffles; and steak and eggs. Also make sure to add on the crispy potatoes from the restaurant’s dinner menu. 10 a.m.-4 p.m.
Head to Catalina Island for a festive weekend that includes and Easter egg hunt, breakfast, brunch, photos with the Easter bunny, three course Easter dinner, hat decorating contest and parade. Brunch over beautiful ocean views. 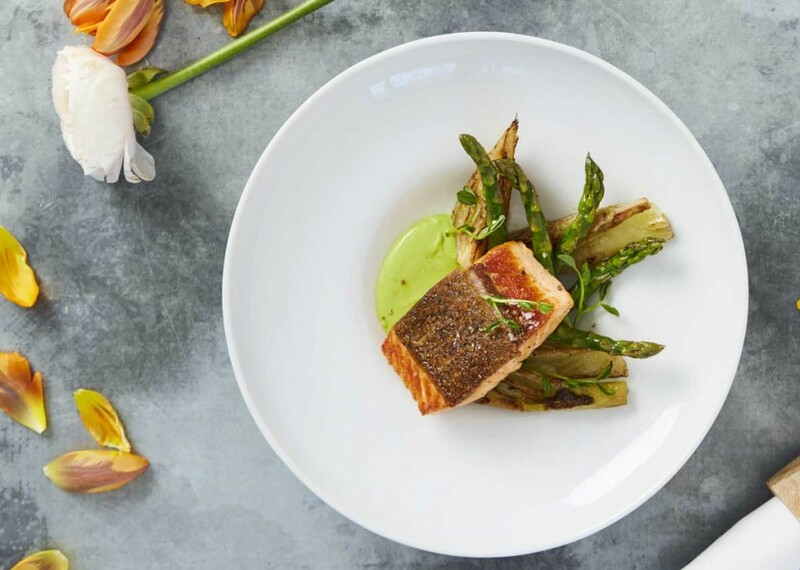 Catch’s three-course prix-fixe Easter menu includes dishes like red snapper with grilled carrots and vegetable couscous; curry broth and grilled and roasted vegetable terrine; and chocolate and salted caramel bar with a feuilletine crust and chantilly cream. 11 a.m.-4 p.m. $90.pp. Patio dining at Cliff’s Edge. Celebrate Easter poolside at the Avalon Beverly Hills. Executive Chef Michael Hung will forgo the regular brunch menu to offer a special three-course prix-fixe menu. Highlights include soft scrambled farm eggs with ramp salsa verde; lemon ricotta pancakes with champagne berry compote and vanilla chantilly cream; slow-roasted leg of lamb with ragout of chickpeas, dates and mint; 8 oz. grilled pork loin chip with roasted carrots; Arctic char baked in parchment, white asparagus, green onions and herb butter; chocolate hazelnut torte with salted caramel and hazelnut dragee; and more. $56/pp. 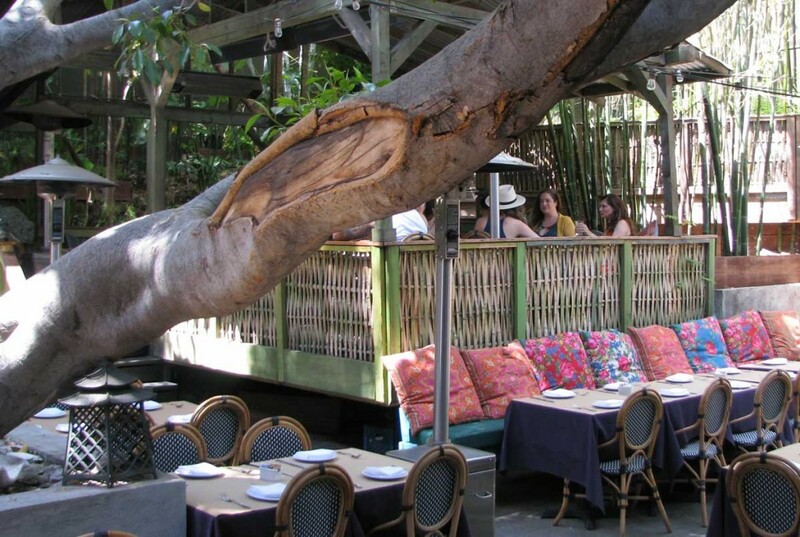 The patio of Cliff’s Edge is the perfect al fresco environment to dine on Easter brunch under a giant sixty-year-old ficus tree. Dine on classic brunch fare like lemon ricotta pancakes with blueberry sauce; eggs Benedict; and pork belly hash; shakshuka; and burrata toast. Also enjoy carafes of blood orange or pomegranate mimosas. 10 a.m.-3 p.m. The California French-inspired garden café downtown offers a three-course prix-fixe brunch to celebrate the holiday. celebrate over dishes like artichoke barigoule veloute with butter poached lobster and crispy sunchokes; housemade prochetta with toasted farro, Calabrian chile, charred baby broccoli, scallions, poached egg; and Braised Rabbit Ravioli with beet greens, spring peas, baby carrots, rabbit jus and Parmesan foam. $55/pp, $19/pp for children 10 and under. Celebrate Easter in the lux surroundings of the SLS Beverly Hills. Tres by José Andrés offers multiple dining stations, lead by an elegant caviar display featuring American paddlefish caviar and salmon roe. Additionally, an extensive holiday carving station will feature roasted beef rib eye and a rack of lamb, among many other lavish options. Also enjoy a Greek yogurt parfait station, which features fresh pears and mixed berries and an endless selection of mini desserts. $70/pp, $35/pp children. 11 a.m.-3 p.m. Celebrate Easter steps from the Music Center with contemporary French favorites. Enjoy a selection of dishes from France’s Rhone Valley, including soup a l’onion gratin with gruyere cheese and croutons; grilled chicken pillard with wild mushrooms, potato purée and sautéed spinach; and Omelette Basquaise with tomato confit, piquillo pepper, onion, chorizo, Petit Basque cheese and roasted fingerling potatoes. $44/pp, $19/pp children 10 and under. Celebrate steps from the beach at the boutique luxury hotel’s brunch buffet. The menu features brie and pear grilled cheese; Cabernet-braised black Angus short ribs; Scottish Salmon filets; and stations offering omelets, pancakes, pastas and salads. 9 a.m.-2:30 p.m. $60/pp, $25/pp children under 10. Suzanne Goin and Caroline Styne’s popular neighborhood restaurant in Brentwood celebrates the holiday over a prix-fixe dinner featuring entrees of vegetarian spinach risotto with marinated artichokes, fava beans, tendrils and soft-poached egg; chicken paillard with saffron peas, radicchio, parmesan pudding and preserved lemon aioli; or spring lamb cassoulet with merguez, cannellini beans, confit tomatoes, cavalo nero and breadcrumbs ($55/pp). Tavern and The Larder will also be serving brunch from 10:00 a.m.-2:30 p.m.
Channel your inner child at the festive three-course brunch that features green eggs and ham, crab omelet and a dessert buffet (think assorted macarons, brioche bread pudding, worms in dirt, pie pops). Also enjoy an Easter egg hunt and more. $33/pp. Dine steps from the most exclusive shopping in L.A. The restaurant’s all-day Easter brunch offers terrace seating and dishes like deviled eggs with shrimp and pickled fennel; smoked salmon with dill cream cheese on a sesame bagel; foie gras French toast with brioche and roasted apples; crab cake Benedict with chive hollandaise and more. Celebrate over an Easter-themed champagne brunch featuring favorites and seasonal dishes like seared king salmon with spring rice and ginger carrot sauce; herb roasted prime rib with horseradish cream and au jus; and traditional eggs Benedict with Canadian bacon, poached egg and fresh hollandaise. Gourmet carved meats, fresh seafood, market salads and a full dessert spread complete with an elegant chocolate fountain will also be available. 9 a.m.-4 p.m. $62/pp, $29/pp children 5-11. Easter brunch features chicken ’n’ waffle with buttermilk fried chicken and maple syrup; crab cake Benedict; shrimp ’n’ grits and more. Dinner brings a three-course menu featuring grilled asparagus salad, wood-grilled rack of lamb and spiced couscous with feta and pine nuts. Brunch is a la carte; $50/pp dinner. The swanky Santa Monica hotel offers a decadent Easter brunch for the holidays. Enjoy everything from cocktails like an Easter egg martini; carving, omelet, pancake and French toast stations; platters of smoked salmon and chicken salad; and desserts like coconut macarons, pecan pie tart cannolis and more. 11 a.m.-3:30 p.m. Delight in decadent brunch favorites like Maine lobster Benedict, Belgian waffles, Mastro’s savory tuna burger and other delectable options. Sip on elegant signature cocktails like the bubbly peach bellini or Mastro’s mojito. The restaurant has extended its hours at the Newport Beach location for Easter. See website for all locations and hours. Bring the whole family to enjoy brunch pairs with children’s activities. Menu specials include Dungeness crab and lobster Benedict and Tito’s Cottontail from the bar (vodka, fresh carrot juice, egg white, and lemon), in addition to FIG’s traditional, seasonally-inspired brunch menu. Kids activities include Easter egg hunts, cookie decorating and photos with the Easter bunny. 11 a.m.-2:30 p.m. Both the Fairfax Avenue and the newer NoHo locations offer a solid brunch on their patios. Standout dishes from Chef John Gladish include a decadent chicken fried chicken with sausage gravy, biscuit and fried egg; short rib hash with poached egg and hollandaise; market vegetable frittata; and grilled chicken sandwich with avocado and sambal aioli. A $5 Fat Mary, their house bloody mary sweetens the Easter deal. Toast the holiday over Caulfield’s Bottomless Mimosa Smash Bar ($18/pp) which comes fully equipped with a seasonal selection of freshly squeezed juices, organic slices of fresh fruit and champagne. Also enjoy Caulfield’s Bottomless Bloody Mary Hot Sauce Bar ($18/pp), featuring different heats from around the world, while you enjoy dishes like burrata and sweet pea ravioli, wild mushroom and truffle quiche and deviled eggs with garlic aioli. Dine at either the Beverly Drive or Atwater Village locations to enjoy Mediterranean-inspired fare like shakshuka; khachapuori; a Moroccan Beghrir pancake with mission fig and honey butter; in addition to fresh bright salads, burgers and their signature Middle Eastern flatbreads. 9 a.m.-4 p.m.
Dine on a special prix-fixe dinner menu that includes dishes like soft poached oeufs Florentine over spinach and brioche with a mornay sauce; loup de mer with carrots, peas, pearl onion and pea tendrils, or a roasted leg of lamb with potato dauphinoise and green beans. $52/pp, wine pairings $26/pp. The Brentwood favorite launches their new Sunday brunch this weekend. The Italian-inspired menu includes brunch specialties like brunch pizza, a white pizza with farm egg, pancetta, mushroom and basil; steak and eggs, with black Angus steak, salsa verde, roasted potatoes and two eggs; build your own frittata with spinach, mushrooms, rapini, crispy pancetta, mozzarella cheese, sausage or zucchini; spaghetti carbonara with housemade pasta, egg yolks, smoked pancetta, crushed black pepper and pecorino romano. For the sweet-tooth there are Crespelle Dolci, with choices of banana and Nutella, strawberry and vanilla cream, or caramelized apple and cinnamon; blueberry ricotta pancakes made with organic ricotta cheese and buttermilk served with fresh blueberries and Vermont maple syrup. The Brentwood steakhouse features an Easter brunch buffet that features an array of iced shellfish; carving station with prime rib, glazed Nueske spiral ham and leg of lamb; also enjoy morning fare like eggs Benedict and French toast with mixed berry compote. $75/pp, $45/pp children. 9 a.m.-4 p.m.
Expect pancake battered fried chicken and grits, reuben hash with Russian dressing hollandaise, pork belly with soft cooked egg and ramen gravy, and flowing mimosas and wine. Enjoy a special Easter menu that features a roasted whole lamb with coal-roasted artichokes, crisp fingerlings, mint salsa verde; Sicilian Easter Soup with lamb meatballs, escarole, pecorino dumplings, egg drop; and the Mr. Blue Sky cocktail with St. George Botanviore Gin, Iris, Bitter Truth Violet, lemon, egg white, evaporated cane sugar, Luxardo Sambuca mist. Pair your dining with shopping at Michael Mina’s restaurant inside the Americana at Brand. The three-course menu includes dishes like housemade Merguez sausage with hummus, pine nuts, harissa, feta, and fried chickpeas; fried chicken and ricotta doughnuts with southern slaw; Michael Mina’s signature lobster pot pie with brandied truffle cream and market vegetables; BSLA Blue Burger with truffle aioli, mushrooms, and caramelized onions; and more. Also, enjoy a bloody mary cart built tableside with custom garnishes. The French bakery downtown offers egg-shaped breakfast sandwich with scrambled eggs, bacon, lettuce and tomato that compliments their Easter treats like large chocolate eggs, Easter eclairs and more. Starting March 26. Chef Brian Malarkey’s Ocean Avenue hotspot debuts endless rose for $25/pp, just in time for Easter. Brunch dishes include everything from scrambled eggs to lobster rolls. The rose special is on the menu until Labor Day. 10 a.m.-2 p.m.
El Segundo’s new “Nuevo Rancho” dining hotspot will feature $16 bottomless mimosas and micheladas in honor of the holiday. Pair those with brunch favorites like beef barbacoa with poached eggs, roasted poblano chili omelet, huevos ranchos and more. 11 a.m.-3 p.m. In addition to the regular weekend brunch menu at Manhattan Beach’s stalwart Cal-Ital hotspot, Love & Salt, Chef Michael Fiorelli will be offering an Easter-appropriate ricotta toast with grilled green garlic, housemade lamb sausage, pea tendrils and a soft cooked egg for $14. 10 a.m.-3 p.m. The popular Studio City eatery is adding a lamb hash with eggs, pickled green garlic and salsa verde for $16 to Chef Ted Hopson’s Sunday brunch menu. 10:30 a.m.-2:30 p.m. The West Hollywood plant-based dining destination celebrates with entree and cocktail specials that include Meyer lemon French toast, strawberry rhubarb shortcake, and the Nasca Sour cocktail made with Quebranta Pisco, lemon, aqua faba Early Grey foam and carrot essense. 10 a.m.-3 p.m.
Usually only open for dinner on the weekend, Ocean Prime will be offering a special Easter Sunday Brunch menu. Highlights include crab cakes and eggs, three cheese quiche, blackened wild salmon and blood orange mimosas. 11 a.m.-3 p.m. The Bel Air dining destination offers special dishes like asparagus soup with black pepper crème fraiche; calamari and shrimp with a quick paprika beer batter, jalapeño and red onion tartar sauce; and “Easter Egg” served with baby lettuces, carrot ribbons, grilled asparagus, fried egg and shaved parmesan—to name a few. Chef Chris will also showcase the quintessential Easter dish, roast lamb leg with garlic, lemon oil marble potatoes and cherry mint yogurt sauce. 10 a.m.-3 p.m. The modern Korean BBQ restaurant from Stephane Bombet of Bombet Hospitality and celebrity Chef Chris Oh celebrates the holiday with Korean-style Easter Lamb two ways: lamb ribs marinated with sweet and spicy gochujang chili sauce, and lamb belly served “bossam style” (traditionally pork belly boiled in spices and thinly sliced) with kimchi, yogurt, and mint. To complement, Bartender Ryan Wainwright has recently launched a bottled soju cocktail program with soju infused in-house. Choose between Psy-co (lime skin infused soju, coconut, vanilla bean yogurt foam) and The Facial (genmaicha-infused soju, ginger, and aloe vera) for $10. 11:30 a.m.-midnight. Celebrate the holiday at the French-Mediterranean dining destination inside the Sofitel. The decadent brunch features a seafood display with shrimp cocktail, crab claws and oysters; along with a salad display featuring items like cavatelli with corn, asparagus sun-dried tomato vinaigrette and grans padano cheese; smoked salmon and charcuterie; carving station with porchetta, roasted chicken and branzino; flatbreads and quiche and more. Celebrate the Easter holiday downtown in style. Faith & Flower offers brunch specials for the day that include rosemary-roasted lamb shoulder, ragout of spring peas and new potatoes, wood oven-roasted poussin and handmade cavatelli. Dine on a lamb has and eggs brunch special, their special Easter punch (Opera Prima, Lillet Blanc, ginger ale, homemade oleo, floating strawberries) and roasted rack of lamb dinner special. Celebrate over a special three-course Easter menu that includes egg cocette, parsley-crusted lamb chop and chocolate bird’s nest (Available all day). $55/pp. Pair your Easter brunch with one of L.A.’s top art collections when you dine within the Los Angeles County Museum of Art. Highlights include chopped chicory with bacon lardons, fourme d’ambert, and soft poached egg; brioche French toast with chocolate ganache and hazelnut; pork belly sandwich with soft scrambled eggs and fried shallots; and Brussels sprouts pizza with anchovy, garlic and capers. Celebrate the holiday with a special menu that includes unlimited oysters, sushi, prime rib, and free-flowing champagne. 11 a.m.-3 p.m. $65/pp, $15/pp bottomless mimosas, $15/pp children 10 and under. Dine on a three course Chefs selection menu by Yuichi Natori. 11 a.m.-3 p.m. $49/pp, $20/pp bottomless mimosas, $20/pp children 10 and under. 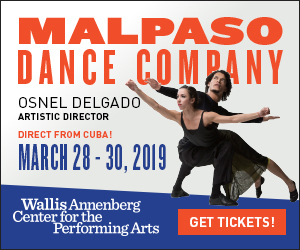 March 26-27. Enjoy a holiday menu of breakfast entrees and signature Benedicts that range from live Maine lobster to soft shell crab. Other selections include foie gras French toast and colossal tiger prawns with Hannah’s noodles. Special for they holidays, you’re invited to find the golden egg by ordering The District’s Fizzy Bunny Cocktail. The lucky winner to find the golden Easter egg in their cocktail wins a VIP Bottle Service Table for six guests to enjoy at the soon to be launched live music night, as well as VIP floor seats to see the Los Angeles Clippers. Hollywood’s favorite English Pub offers a special Easter brunch that includes hot cross buns, house-smoked ham with fried eggs, thrice cooked chips, as well as the signature brunch menu. For dinner, enjoy a maple-glazed Easter ham with roasted carrots, pease pudding and horseradish creme; and slow roasted leg of lamb and mint sauce. Ultimate bloody mary bar at Tanzy. 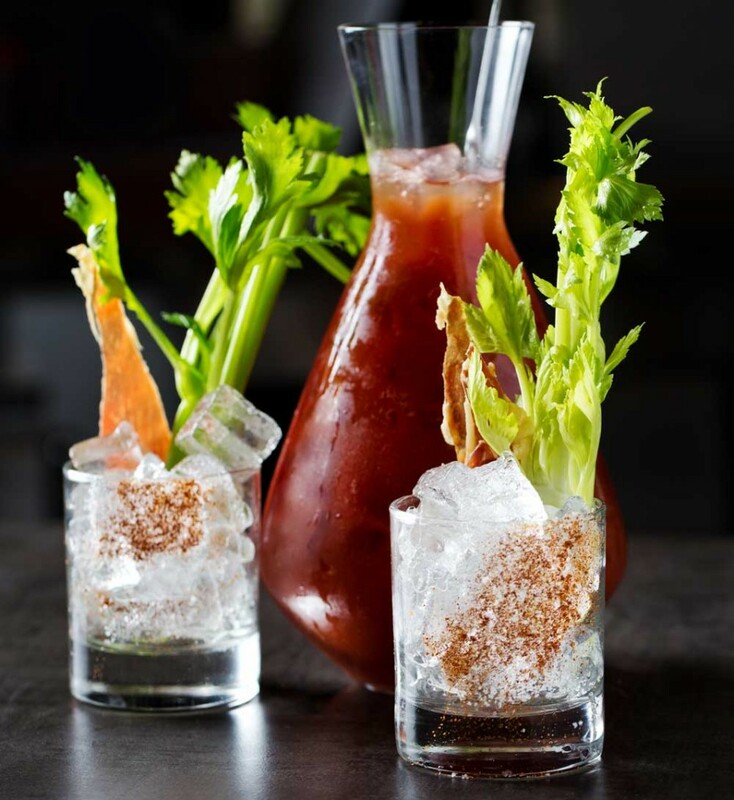 Enjoy a visit from the hipster Easter bunny in addition to brunch highlights like brioche French toast, crispy chicken and sourdough waffles, “bacon & eggs” ravioli, corn been hash and more, including the ultimate bloody mary bar. Spend the holiday in the airy French Riviera-inspired West Hollywood dining destination. Highlights of the three-course prix-fixe brunch include crab salad; vegetarian quiche; steak and eggs; riviera salmon and more. 11 a.m.-3 p.m.
Head to the stunning dining destination to enjoy a special three-course brunch. Highlights include rosemary leg of lamb sandwich, prime rib, eggs Benedict and more. 10:30 a.m.-2:30 p.m. $55/pp, $35/pp children 10 and under. Enjoy a Venetian style Easter buffet brunch poolside at the Italian-inspired hotel. Highlights include made-to-order waffles, fresh crudo and crab claws, slow roasted leg of lamb and more including bottomless bellinis for $30/pp. The Easter Bunny will also make an appearance, and children can join an Easter egg hunt. $105/pp, $49/pp children 4-12. Perfect for families, the South Bay gem offers specials like strawberry waffle shortcake, avocado toast with crumbled feta, bloody mary bar and more. 11 a.m.-3 p.m. Celebrate over an Easter brunch buffet that includes all the must-haves like a custom omelet creation station, short rib and filet mignon carving stations, scallop and salmon plates, a full fresh seafood bar (crab, shrimp, oysters, clams, mussels) and more. 11 a.m.-3 p.m. $79/pp (includes champagne), $35/pp children. The seafood-centric Hollywood restaurant offers Easter specials for brunch and dinner. Brunch offerings include ham hock hash with peas, asparagus, fingerling potatoes, mustard vinaigrette, poached eggs and grilled bread; smoked trout rillettes with arugula, radish and a six-minute egg; and Maine lobster omelet with burrata, spinach and soft herbs. Dinner offers Dungeness crab, pea pappardelle, pea tendrils and young carrots; rotisserie lamb shoulder with yogurt, cucumbers, beets and naan; and grilled whole fish with braised leeks, fingerling potatoes, charred escarole and romesco. Popular Hermosa Beach brunch spot offers brunch favorites like their Maryland crab cake Benedict, carrot juice mimosas served through lunch and Easter ham for dinner. The historic hotel downtown features brunch in their Crystal Ballroom complete with a buffet, complementary sparkling wine, cookie decorating and a visit from the Easter Bunny. $62/pp, $28/pp children. Enjoy Easter with an ocean view at the lobster with Chef Collin Crannell’s lobster and shrimp sausage chilaquiles brunch special. Enjoy an Easter brunch menu that includes specialties such as Agnello Pasquale—lamb shank braised in Sangiovese wine, root vegetables and tomatoes; served with mashed potatoes and sautéed organic spinach. So you’ve got an afternoon to spend in San Diego but a limited budget? No problem. There are plenty of awesome ways to experience San Diego without breaking the bank. Naturally, there’s the beach. San Diego has some of the best beaches in the country, outside of Hawaii. And all beaches are free and open to the public. And yes, the water is usually warm enough to swim in. If there’s enough wind for your sails, you could also fly a kite on grassy fields along the Tecolote Shores of Mission Bay Park. No need to worry about power lines or trees, Charlie Brown. The 4,600-acre aquatic park also has quite a selection of biking and hiking trails for the whole family to enjoy.